The last six years of my mother’s life were lived from a wheelchair. Her left leg was amputated due to poor circulation. Mom’s disability limited my parents’ mobility. Therefore, to get them out of the house, every Tuesday I’d pack them in my car and we’d run errands and go to lunch. The cashiers’ reactions were mixed, as were my own. Most days, I enjoyed her eccentricity. On a bad day, I felt annoyed or even embarrassed. The clerk was normally surprised. However, they were often pleased that someone noticed them beyond their function. Mom saw them as a person with a name and a story. Depending on the clerk’s response, I could guess where my mother would go next. If they had a saint’s name, she’d follow with, “You must be Catholic.” Or sometimes (as an immigrant herself in Cleveland, a city of immigrants), she’d ask, “What’s your nationality?” Some enjoyed the exchange. Others were aggravated by this interruption to their productivity. They’d answer with barely a glance and continue working. It never deterred her though. Mary kept right on smiling and making friends. Eventually, I noticed something. People knew my mother’s name. 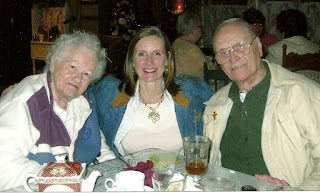 The three of us would walk into a store or restaurant or doctor’s office and someone would call out, “Hi, Mary.” Although Dad and I were always present, no one said, “Hi, Peggi” or “Hi, Cyril.” They did not know our names. But, they knew Mary. And, if I entered their place of business without her, I’d hear, “Where’s Mary today?” People remembered the friendly old lady in the wheelchair. I sometimes ponder how my mom developed this social skill. Perhaps it was born of necessity. At eleven years old, she crossed the Atlantic alone on a ship from her little village of Brezovička in Slovakia to the huge metropolis of Cleveland, Ohio. In her village, everyone knew everyone. But in the entire United States of America, my mother knew only one person—her own mother. 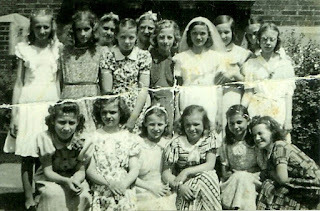 If young Mary wanted friends, she had to learn how to make them. She learned, because people mattered to my mother. She valued relationships. A man who has friends must himself be friendly. I recently read a quote that said, to have friends, you must be a friend (paraphrase). I am naturally introverted so close friendships don't come easily but as I age, I am much more comfortable talking to strangers. I like to make them smile. Perhaps I learned it from Erik. Like your mom, every place we go on a regular basis knows Erik and when he's not with me, they ask about him. What a gift! It is a gift. I'm glad that Erik comes by it naturally. My husband is always talking to strangers, also. I can be more focused on productivity than people/relationships. God is always reminding me that his priority is people. He used my mom's example to help bring that lesson home. If every person in the world would learn this lesson, we would have a different world. What a wonderful legacy to leave behind. My mother and my father were both people persons. When my mother walked this earth, she had time for everyone. There were times when neighbors would call with a problem and no matter what my mother was doing, she would stop and listen. I learned from my parents that people are first because they lived it before my very eyes. I used to laugh when I went home to visit them, because everyone called them Mama and Papa. They had more children than I could count in our church. They were just people with big hearts and so was your mother. She was blessed to have a big heart and that heart was filled with love for everyone. She walked out her faith in love. I enjoyed this article so much and I hope you had a blessed Thanksgiving. Thank you! Your comments have me grinning from ear to ear. I wish I could have met your parents. You are such a "people person" yourself - and with your description of them - I can just imagine your Mama and Papa. Yes, Patricia, we have been blessed with a wonderful legacy of love!